A selfie taken by Prime Minister Hun Sen in his car and posted to his Facebook page on Saturday. 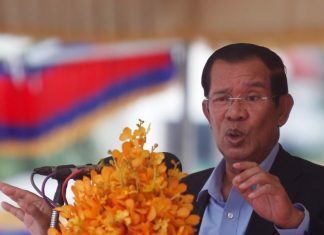 Cambodia’s Cabinet has not held its constitutionally mandated weekly meeting since June 16, fueling speculation about Prime Minister Hun Sen’s health and confusion over why officials have forgone the meetings. Council of Ministers spokesman Phay Siphan on Tuesday denied anything was amiss and said Mr. Hun Sen’s public appearances proved his fitness for work. 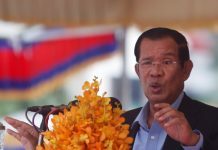 Rumors that Mr. Hun Sen was unwell and seeking treatment abroad began swirling on Facebook earlier this month​​. One frequent government critic, called Cham Chany, claimed the prime minister had gone to Singapore for medical care and had not appointed an acting leader in his absence. Mr. Siphan said the Cabinet last met before the CPP’s June 28 anniversary—a date when Mr. Hun Sen proposed controversial changes to the Law on Political Parties that were quickly passed by the National Assembly—but could not remember the exact date. A website for the Cabinet’s Press and Quick Reaction Unit shows notes for a June 16 meeting. Official Cabinet statements posted to Mr. Siphan’s Facebook account show Mr. Hun Sen requested delays to two subsequent meetings scheduled for June 23 and June 30. The office appears not to have issued any subsequent statements or given reasons for the lack of meetings. Article 123 of the Constitution says that the Council of Ministers “shall convene every week in plenary session or in working session,” while the 1994 Law on the Organization and Functioning of the Council of Ministers empowers the prime minister to call Cabinet meetings without stipulating a frequency. The Council’s plenary sessions “shall make decisions on general affairs of the royal government,” according to the law. Mr. Siphan said that while he had “no idea” when the group would reconvene, there was an “internal mechanism” to keep the prime minister apprised of ministry activities, and these unspecified channels met the Constitution’s requirements. Legal expert Sok Sam Oeun was unfamiliar with the Constitutional requirement and said he had never heard of it being enforced. 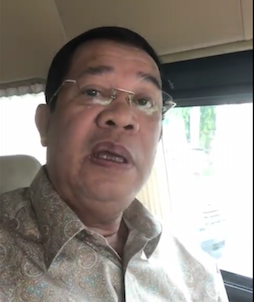 Dogged by the Facebook rumors of alleged overseas hospitalization, Mr. Hun Sen posted photos of family members and loyalists in what appeared to be Singapore, asking whether he needed to keep the country appraised of his whereabouts. But the prime minister did not designate an acting deputy while he was away, as he generally does for overseas trips, and Mr. Eysan continued to deny Mr. Hun Sen had ever left. 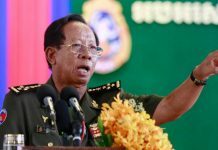 Mr. Hun Sen has appeared in public on several occasions over the past several weeks, including a short, scripted speech at the Peace Palace in Phnom Penh on Monday. The prime minister was hospitalized in Singapore in May for extreme exhaustion, according to his Facebook page. He has fought back speculation of ill health before, including a 2014 rumor that he had suffered a massive stroke and had been whisked to Singapore for treatment. Ou Virak, head of the Future Forum think tank, described the absence of Cabinet meetings as “unusual” but doubted that it was unprecedented. “There must be times we didn’t pay attention,” he said, adding the prime minister’s absence tended to spin the rumor mill. Nor did he think the lack of meetings would have much of an effect on governing the country. “Everything’s done over WhatsApp these days,” he said, referring to the messaging app. But social scientist Meas Nee said the prime minister’s infrequent public appearances and lack of Cabinet meetings caused the public to jump to conclusions of ill health or tension within the CPP.